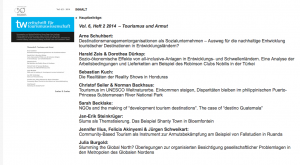 We are happy to annouce that the first special issue with some papers from the slum tourism Destination Slum 2 network conference in May 2014 has come out. 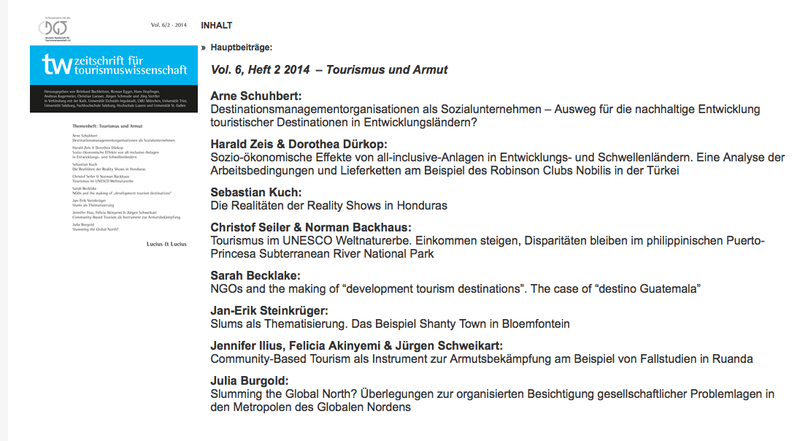 The special issue Tourismus und Armut in the Zeitschrift für Tourismuswissenschaft. The special issue was edited by Norman Backhaus, Fabian Frenzel and Malte Steinbrink. The special issue is diveded in two parts. One part features papers that revisit the question how tourism can alleviate poverty, while the second part focusses in on poverty as an attraction in tourism. Papers from the conference include the contributions of Sarah Becklake, Julia Burgold and Jan-Erik Steinkrüger. In the introduction to special issue, Malte Steinbrink and Fabian Frenzel show the growing numbers of destinations and tourists in slum tourism. In 2013, an estimated one million tourists went on a slum tour globally. Most of the papers are in German and the papers are not yet available online. The print issue can be ordered via the journal webpage.